Permission to come aboard, sailor! Make happy hour even happier. 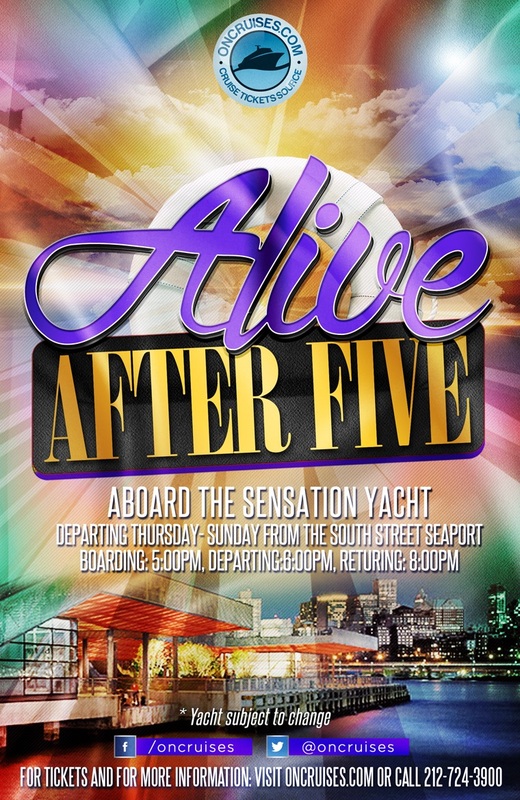 Get together with your coworkers and friends and jump aboard Alive After Five. Take a break from the rat race without leaving the city, get out on the water and enjoy cocktails, beer, wine, delicious bar snacks and more while taking in all the sights of NYC. Catch up with friends, celebrate a birthday, drink to the end of the working week. Do you really need an excuse? You’ll be joined on board by a DJ, occasional local acts, live radio broadcasts and more. Mix, mingle, make new friends and have a good time! Take a look at Hornblower’s food and drink options and turn it into an occasion. All ages are welcome, please call for senior, military and child discount. * Venue subject to change without notice. NO REFUNDS OR EXCHANGES. ALL SALES and REDEMPTIONS ARE FINAL. Buyer agrees that all tickets purchased, specific to the transaction entered herein through the online ticket services provided on this Website, constitute a Final Sale. Buyer further agrees that all tickets purchased are non-refundable. By browsing and using the ticket services of this Website and completing a ticket purchase transaction on this Website, Buyer agrees to be legally bound by the Terms and Conditions stated herein. Purchaser’s credit card statement will show the merchant account posted as ticketing agent on this website, (herein "Ticketing Agent"). Unless specifically indicated, it is important to note that this Website and the Tickets offered are only available and open to users 21 years of age or older in the United States and for personal use for those of a legal age in your country, province, or state of residence for the consumption of alcoholic beverages. If for any reason, you as a Buyer do not agree with some and/or all of the following terms and conditions, you as a Buyer are not of a legal age in your place of residence for consuming alcoholic beverages, we recommend that you exit this Website and discontinue the Ticket purchase process. Ticketing Agent and any and all of its associated website(s) are ticket sellers and resellers do not guarantee the accuracy, integrity or quality for any of the information and representations for products or services made by the Venue, the Website or Resellers, or Promoters for the event listed above. Ticket Agent and any and all of its associated website(s) will not be liable for any damages of any kind incurred as a result of the information contained herein. Ticketing Agents and any and all of its associated website(s) disclaims any and all warranties relating to the services including warranties of merchantability and fitness for a particular purpose or use. Furthermore, the Venue offering the event tickets reserves the right to make any changes it deems necessary to maintain customer safety and to make reasonable substitution of event amenities. Purchase of this ticket is non-refundable for any reason including but not limited to any dissatisfaction customer has with the event experience; waiting on line for admission; any change in services including start and end times, venue's limits on complimentary amenities such as menu selections and/or drink brands; and any changes to seating or table locations. If purchaser is dissatisfied, Purchaser must see an onsite manager, make a claim and exit the event prior to consuming alcohol or availing any of the event amenities. Purchaser further agrees that tickets are non-refundable due to Purchaser's failure to attend event for any reason and/or any problems due to weather, which create hardship in attending the event. Purchaser waives any right to dispute the above stated credit card charge for any reason other than a cancellation of the event by the Venue. Purchaser acknowledges that Venue reserves the right to delay admission due to capacity restrictions and any issues that may arise affecting public safety. Policies set by Ticketing Agent prohibit the issuing of exchanges or refunds after a ticket purchase has been made or for lost, stolen, damaged or destroyed tickets. Therefore, when a ticket is released by pick-up, mail, E-ticket or will call, it is the responsibility of the Purchaser to keep their ticket and confirmation of purchase in a safe place and present tickets at the door for admission. Cancellation of your order is not permitted at any time after you place your order. There are NO REFUNDS, NO CANCELLATIONS, no credits, no exchanges, and no transfers after the order has been made. If you purchased for the incorrect date, location, event, etc, we are not obligated to provide a refund, credit, exchange or transfer. Purchaser agrees that all events and cruises will occur rain or shine. Purchaser agrees that iEvents.com is not responsible for any last minute firework cancellations or obstruction of view of fireworks. In the event fireworks are cancelled or an obstructed view does occur, no refund will be provided and the purchaser agrees that all sales are final and that they will not chargeback. As third parties provide the majority of the party information; iEvents.com does not guarantee the accuracy, integrity, or quality of any of the information contained here or any products or services listed here. iEvents.com will not be liable for any damages of any kind incurred as a result of the information contained here. iEvents.com disclaims any and all warranties relating to the service, including warranties of merchantability and fitness for a particular purpose or use. The venue photos were not necessarily taken on prior the parties; therefore it is not necessarily reflective of the event’s decor, ambiance, or crowd. Under no circumstances will a replacement ticket be issued for any ticket that has been damaged, lost, stolen, or destroyed. If an event is age restricted, you certify that all ticket holders meet the minimum age requirement and will bring proper id to that event. If you are denied entry based on age requirements, you will not receive a refund for this purchase. Venue and talent are subject to change. If a party advertises a celebrity host, there is no guarantee that you will see, meet, or interact with the celebrity. In fact, sometimes the celebrities have last-minute cancellations. If the celebrity does not appear at the event, iEvents.com is not responsible, and this is not grounds for a ticket refund. Certain venues offer will call tickets. If this is the case, no physical tickets will be shipped to you. You simply need to present a valid picture id, the original credit card used to make this purchase, and a copy of your order confirmation at the venue. If you are unable to pick up your order because you do not have the required items listed above at the time and place of pickup, you will not receive a refund for this purchase. Purchaser acknowledges that the name(s) entered on the order form will be released to the event promoter to facilitate order pickup at the venue. All tickets for a single order must be picked up at the same time. WITH WILL CALL TICKETS, THE INDIVIDUAL INDICATED ON THE ORDER FORM MUST PRESENT A VALID PICTURE ID, ORIGINAL CREDIT CARD USED TO PLACE THE ORDER, AND A COPY OF THE ORDER CONFIRMATION EMAIL AT THE EVENT TO RECEIVE ENTRY. When ordering or registering on our site, as appropriate, you may be asked to enter your name, email address, mailing address, phone number, Date of Birth or other details to help you with your experience. Buyer agrees that all tickets purchased, specific to the transaction entered herein through the online ticket services provided on this Website, constitute a Final Sale. Buyer further agrees that all tickets purchased are non-refundable. By browsing and using the ticket services of this Website and completing a ticket purchase transaction on this Website, Buyer agrees to be legally bound by the Terms and Conditions stated herein. Purchaser’s credit card statement will show the merchant account posted as ticketing agent on this website, ( herein "Ticketing Agent"). Unless specifically indicated, it is important to note that this Website and the Tickets offered are only available and open to users 21 years of age or older in the United States and for personal use for those of a legal age in your country, province, or state of residence for the consumption of alcoholic beverages. If for any reason, you as a Buyer do not agree with some and/or all of the following terms and conditions, you as a Buyer are not of a legal age in your place of residence for consuming alcoholic beverages, we recommend that you exit this Website and discontinue the Ticket purchase process. Ticketing Agent and any and all of its associated website(s) are ticket sellers and resellers do not guarantee the accuracy, integrity or quality for any of the information and representations for products or services made by the Venue, the Website or Resellers, or Promoters for the event listed above. Ticket Agent and any and all of its associated website(s) will not be liable for any damages of any kind incurred as a result of the information contained herein. Ticketing Agents and any and all of its associated website(s) disclaims any and all warranties relating to the services including warranties of merchantability and fitness for a particular purpose or use. Furthermore, the Venue offering the event tickets reserves the right to make any changes it deems necessary to maintain customer safety and to make reasonable substitution of event amenities. Purchase of this ticket is non-refundable for any reason including but not limited to any dissatisfaction customer has with the event experience; waiting on line for admission; any change in services including start and end times, venue's limits on complimentary amenities such as menu selections and/or drink brands; and any changes to seating or table locations. If purchaser is dissatisfied, Purchaser must see an onsite manager, make a claim and exit the event prior to consuming alcohol or availing any of the event amenities. Purchaser further agrees that tickets are non-refundable due to Purchaser's failure to attend event for any reason and/or any problems due to weather which create hardship in attending the event. Purchaser waives any right to dispute the above stated credit card charge for any reason other than a cancellation of the event by the Venue. Purchaser acknowledges that Venue reserves the right to delay admission due to capacity restrictions and any issues that may arise affecting public safety. Policies set by Ticketing Agent prohibit the issuing of exchanges or refunds after a ticket purchase has been made or for lost, stolen, damaged or destroyed tickets. Therefore, when a ticket is released by pick-up, mail, E-ticket or will call, it is the responsibility of the Purchaser to keep their ticket and confirmation of purchase in a safe place and present tickets at the door for admission.Cancellation of your order is not permitted at any time after you place your order. There are NO REFUNDS, NO CANCELLATIONS, no credits, no exchanges, and no transfers after the order has been made.If you purchased for the incorrect date, location, event, etc, we are not obligated to provide a refund, credit, exchange or transfer. Once you make a purchase on Ticketing Agents website(s), if those funds are removed from the company’s account and given back to you, you owe us that money back, plus applicable fees as outlined below. If you owe money to Ticketing Agent said entity reserve the right to take legal action against you and/or send you to collections for the recovery of said debt. If you are in debt to iEvents.com, iEvents.com reserve the right to send you to collections or take legal action immediately, regardless of the age of the account, or presence or lack of notification attempts. If legal action against you or send you to collections, you are fiscally responsible for any and all legal costs and fees, directly associated and/or indirectly associated, with recovering the debt owed by you. If legal action is taken against you or you are sent to collections, you will be charged an additional $100 fee that is due payable immediately. Further, if you have charged-back your credit card and we incur a fee from that, you are fiscally liable for any and all fees that we have incurred as the result of your chargeback action, of a minimum of $50 per chargeback and up: this chargeback fee is due payable immediately. Furthermore, you will be charged a $50 administrative fee per chargeback appeal that had to be written and filed as the result of your chargeback: this administrative chargeback fee is due payable immediately. Additionally, any debt to iEvents.com, including the aforementioned fees, will be charged a minimum of a 25% interest on the debt until paid in full; we reserve the right to charge this interest as a one-time interest or as a compounding interest that escalates with the age of the account. iEvents.com collection’s agencies reserve the right to negatively affect your personal credit score until your debt is paid. Once an account has been placed in collections, the only way to get yourself out of Collections is to pay the debt owed by you to the collections agency.